We don’t know how old this property is. We have a copy of a document dated 1755 which lists the ‘Horseshoe’ as one of the beerhouses in Thornbury at that time when the licensee was Elizabeth Holbrow and her surety was Robert Pountney. The 1769 Assessment for the Relief of the Poor shows ‘Robert Pountney for the Horseshoe’. We also have a copy of the last will and testament of Richard Williams dated 1785 which refers to one of his properties being called the ‘Horseshoe’. The photograph on the left shows clearly that it was probably built as two separate properties, but it was a single property on the 1840 Tithe Map and throughout most of the period since then. During this time, it has been used as a grocer’s shop, public house and a shop selling china and earthenware. We know that during the 1900’s the right-hand part of the property was used as a house and the left-hand side as a shop with storage above. In the 1950’s the property appears to have been split into two separate units which became known as 25 and 25A St Mary Street. Richard Williams was pargeter or plasterer and tiler. He was born about 1718 based on his age at his death. On 9th April 1774, Richard married Mary Knott. We know from the inscription on his gravestone that she was his second wife. His first wife was Unity Aldridge who died aged 61 and was buried on 7th October 1770. In spite of his advanced years, Richard and Mary managed to have two children: John was born on 26th September 1776. The baptism records appear to show John was baptised twice – first on 26th January 1777 when it was noted that he was the first child and very ill. The second time was on 28 September 1778 when there is note to say that he was ‘publically received’. We assume that the first baptism may have been done quickly at home when they were concerned he might die, the second was a full church baptism. Another child, Richard Williams was born on 19th April 1782 and baptised on 20th October 1782. The 1775 Land Tax record shows Richard was responsible for paying the tax on the property described as ‘late Pounteys’. Richard senior died on 17th January 1786 aged 68. In his will Richard left his estate for the use of his wife during her natural life, provided she did not re-marry. After Mary’s death, he left the Horseshoe and two other properties in St Mary Street, one in which Richard and Mary were living and a smaller one adjoining it (believed to be 53 and 55 St Mary Street) to his son, John Williams. The Horseshoe was referred to as that ‘messuage or tenement called the Horseshoe …. now in the occupation of William Attewell’. This will was written in 1785 but not proved by his widow until 1820. On the basis of the wording of the will we suspect that the place was being run as a beerhouse by William Attewell because it was being referred to as the Horseshoe, not ‘lately called the Horseshoe’ or similar. Richard left other properties to his youngest son, Richard: a property in Castle Street referred to in his will as ‘late Cannings … now in the occupation of William Longden’, a newly erected house with a garden and orchard in the occupations of Robert Wiltshire and John Tilly (which later became known as 41 St Mary Street) and a new house built adjoining the Horseshoe (which might either refer to the house which became 25A or 27 St Mary Street). In his will Richard left his son Richard a silver pint cup marked ‘R.W. Ale’. We assume that the R.W. stands for Richard Williams and this might indicate that Richard had run the Horseshoe as a beerhouse even though William Attwell was letting it from him at the time of his death. Richard’s widow, Mary, lived until about 1821. John Williams was a cordwainer (shoemaker) and he married Mary Bedggood on 3rd May 1801. John died aged only 26 and was buried on 9th June 1803. In his will he refers to the property which he expected to inherit after his mother’s death. This included the ‘messuage or dwelling house lately called or known by the name or sign of the Horseshoe wherein William Attwell sometime since inhabited and Thomas Young baker lately dwelt and I now dwell’. So, it would appear that the property had ceased being a beerhouse at some time since 1785. John’s will directed that the properties he expected to inherit on his mother’s death should be put in trust for the use of his wife during her lifetime and then given to his only son, James Williams. James died in 1817 aged 15. He was buried in St Marys Churchyard on 17th October 1817. Thus the bequests made by John’s father and John himself failed and John’s widow, Mary, inherited the property. By this time Mary had re-married. She had married Henry Wilkes at the church of St Phillip and St Jacob in Bristol on 23rd September 1811, so Henry appears to have become the owner. Henry and Mary Wilkes – the land tax records show that Mary Williams junior carried on living in the house following her first husband’s death and after she married Henry Wilkes in 1811. Henry was a watch and clock maker. They had three children: Ann baptised on 14th July 1813, Jane baptised on 12th July 1815 and buried on 17th December 1815 and Emma baptised on 18th June 1817. Henry Wilkes died on 17th April 1828 aged 48. R. W. Miller & Co – on 16th October 1890 the Horse Shoe was bought by Robert William Miller of the Stokes Croft Brewery in Bristol. The price paid was £775. By 1893 Robert had formed the R. W. Miller & Company and transferred the property to its ownership. (The Company was eventually taken over in 1911 by George’s Brewery in Bristol). The Horse Shoe Inn closed as a pub on 13th March 1907. The 1904 Licensing Act gave licensing authorities the power to close pubs on the basis of them being in excess of requirements. 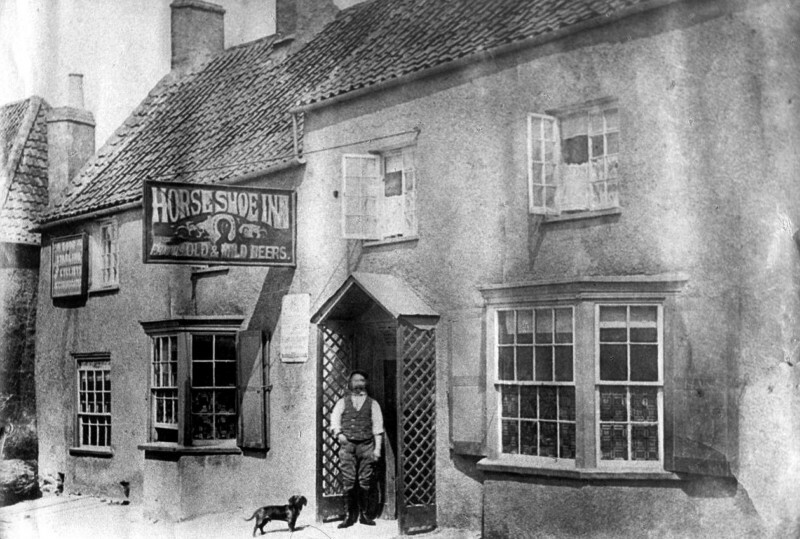 In 1905 The Horse Shoe was one of two pubs considered for closure in Thornbury, the other being the Queens Head. The Police argued that the Horse Shoe ‘was not required as it was situated in the centre of St Mary Street within a few yards of the Porters Stores and a short distance from Plough, from the Wheatsheaf and from the Queens Head’. The representative of the landlord referred to the good trade which the pub had and submitted a petition signed by 98 locals wanting the pub to stay open. He asked why the Horse Shoe was chosen as the one to close and the Police answered that ‘it is less convenient to the public than the others’. The Licensing Authority agreed to close the Horseshoe, although the Queens Head was allowed to continue operating. There was a long period of negotiation over the level of compensation due. The initial claim for £1517 was based upon takings of about £14 or £15 per week. The amount was rejected by the Authority and they made an offer of £880 which was rejected by the Owners. An amended claim was for £1018 10s. The Gazette dated 20th March 1907 reported that the R. W. Miller was paid £865 10s and the licensee, H. T. Holmes was paid £175 in compensation. Francis James Williams – on 16th May 1907 Francis Williams purchased the property following the auction. The price appeared to be £205. Francis (shown in the photo on the right) was a brushmaker and seedsman who traded on the High Street. He was also an Assistant Overseer and Secretary for the Cossham Hall and Parish Clerk from 1894 to 1927. Francis was born about 1850, the son of James Williams, a brushmaker and his wife, Sarah. Frederick Pearce – the 1910 electoral register shows Frederick as the occupant of the property. The 1911 census shows that Frederick was an unmarried market gardener aged 27 from Littleton. He was living there with his twin brother, Charlie Pearce, also a market gardener, their sister, Lilye Miller aged 33 and her husband, Thomas Miller and their son Frank Leslie Miller aged 2. The 1909 Prewett’s Almanac lists ‘F. & C. Pearce’ as being a ‘bakers etc’ in St Mary Street. There is no sign of Frederick in the 1918 electoral register, but there is a Sarah Pearce living somewhere in St Mary Street. In 1921 both Fred and Sarah are listed and in 1927 Sarah is listed as well as Arthur Thomas Pearce whom we assume to be Sarah’s son as he is living in the same house as Sarah. George and Rachel Hill – George bought the property from Francis Williams on 29th September 1920. The price was £480. At the time of the sale George’s address was in Crossways. George was a china and earthenware dealer and he called his shop ‘Eclipse Stores’. There is an advert in the Thornbury Town guide of the 1930’s in which George claims that ‘For 30 years the vans of George Hill have been noted throughout South Gloucestershire. A postcard to the Eclipse Stores, Thornbury will ensure a call. George Hill, the noted Hardware Dealer’. By 1939 they had moved to live at 5 Thornbury Road, Alveston. George was listed as a hardware shopkeeper. Gilbert and Sarah Ann Gazzard – the register compiled in 1939 in preparation for the war shows Gilbert J Gazzard and Sarah Ann Gazzard living at the Eclipse Stores. Gilbert was described as ‘Mechanic, oil, hardware and chandler born on 20th April 1909. Sarah Ann was described as housewife and shop assistant. Their daughter, June, born on 13th June 1935 was also living there. Gilbert John Gazzard was born on 20th April 1909, the son of William Gazzard, a gardener and his wife, Florence. In 1911 they were living at Elberton. He was baptised in Elberton on 13th June 1909. Gilbert married Sarah Ann Price in Thornbury in June quarter 1934. Sarah Ann was born in the Pontypridd area on 20th October 1909. They were listed as living in St Mary Street in the 1935 electoral register. Bill and Florence Lambert – on 17th July 1942 Bill bought the property from George Hill for £1000. Bill was already running the store and living there at the time of the sale. William Thomas Lambert was born in 1897, the son of Thomas Lambert and his wife, Jane. In 1901 the family lived at Hackett Lane and Thomas was a carter for a miller. As a young lad during the First World War William was working for Thompson, the baker and he applied for exemption from military service but we are not sure if he was successful. We have found a seaman’s record for William Lambert of Thornbury born in 1898 which we suspect may refer to Bill. In 1921 he was serving as a Steward on SS Killoran and the record shows it was his first voyage. It describes Bill as 5ft 2 1/2 inches, fair hair and fair complexion and blue eyes. In 1923, William married Florence Beatrice Beese in the Bristol area. They had one daughter, Esme, baptised on 15th September 1929 when William was employed as a motor driver. The 1926 Rate Book shows Bill was occupying 21 Pullins Green and he is also shown as living on Pullins Green in the 1927 electoral register. Florence is not listed in the 1927 register, but she is listed in the registers of 1931, 1935 and 1938 when she and Bill were living at 27 Eastland Avenue. On 20th February 1946 Bill bought the little house at 20 Rock Street. He paid £450 for the house. The family never lived there, but let it out to tenants. On 4th October 1950 the Lamberts sold this property for £420. The 1946 electoral register shows Bill had become an ironmonger and taken over the Eclipse Stores at 25 St Mary Street. He is described in one document as carrying on the business of hardware and oil merchant and ironmonger. On 4th February 1948 Bill and Florence’s daughter, Esme, married James Murray. James was a police constable from Winford in Somerset, but was originally from County Armagh in Northern Ireland. Esme was working as a shop assistant at the time of the marriage, presumably in her parent’s shop. Bill and Florence carried on in St Mary Street until at least 1954. On 14th September 1954 Bill gifted the Eclipse Stores to her daughter and her husband, James and Esme Murray, who were already living there. On 14th January 1955 Bill also gave them them the goodwill of his business and all the stock and equipment including the delivery vehicles. There is no sign of the Lamberts in Thornbury in 1958. Bill died in October 1973 aged 76. James and Esme Murray – the 1958 electoral register shows James and Esme were living there. Esme was the daughter of Bill and Florence Lambert – see above. It appears that at least initially the store was still run as “W. T. Lambert” as an advertisement in the 1958 Thornbury Flower Show programme still gives that name for the Eclipse Store in St Mary Street. The store was said to stock hardware, Esso Blue paraffin, china and glassware and seeds. James and Esme had a son, Nigel James born on 5th February 1951. The baptism record shows James was a ‘hardware roundsman’ at the time. On 2nd February 1959 James and Esme sold the Eclipse Stores to Norman Colin King for £1700. It is interesting to read the sales notice of 1958 which valued the property at £3,000. The business was described all that messuage, yard, garage, coach-house, stable and premises. The plan attached to the indenture suggests that the property consisted of the two buildings which became 25 and 25A St Mary Street Street. Norman King – Norman was the son of Charles and Hilda King and he took over the ”Eyles and King’ cycle business located on the other side of Horseshoe Lane at 23 St Mary Street. We know from photographs that number 25 was used as a betting shop run by Joe Conway and that number 25A was used as a toy shop but we don’t know who ran the business. Norman was listed in the 1967 programme for the Flower Show. The local parish magazine mentions that ‘L W Gatfield Watchmaker & Jeweller‘ was at 25a St Mary Street from September 1969 to January 1972. He had previously been trading at 1 High Street. We don’t know any more about this business. On 23rd March 1978 Norman King sold the property to Thornbury Rural District Council for £17, 780. It was incorporated into the the new shopping centre as two separate units: one a hairdressers and beauty shop, the other a bakers, cafe and most recently as a kebab fast food takeaway and cafe. Click on the thumbnails below to see other views of the property taken in 1960’s and 2009.